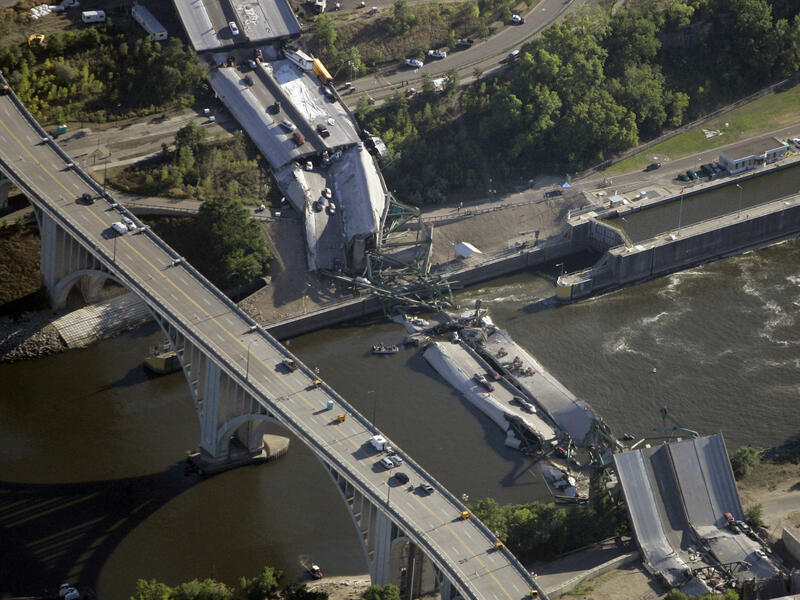 The collapsed 35W bridge in Minneapolis seen on August 2, 2007. The new Interstate 35W bridge, which replaced the old bridge, seen in July 2008. In the immediate aftermath of the 35W bridge collapse, the Minnesota Department of Transportation came under intense scrutiny. The interstate highway bridge had been classified as structurally deficient, meaning that it was aging and in need of repair. In fact, some repair work was going on when it fell. And the bridge was also rated as fracture critical, meaning the failure of just one vital component could cause the whole bridge to collapse. But in fact, neither of those classifications means a bridge is necessarily dangerous. And the National Transportation Safety Board determined that it was a design flaw, and not deferred maintenance, neglect, or other problems, that caused the 35W bridge to collapse. Gusset plates that hold the bridge's huge steel beams together were only half as thick as they should have been. The NTSB also found that nearly 300 tons of construction equipment and materials stockpiled on the bridge deck for the ongoing repair work contributed to the collapse by further stressing the crucial gusset plate that failed. Nancy Daubenberger was still in the bridge office of the MnDOT just after 6:00 p.m. CT, when a colleague called with the horrifying and heartbreaking news. "The first feeling was shock," says Daubenberger, then a bridge engineer for the state and now the director of engineering services for MnDOT. "The shock that came over me, that such a large bridge like that could collapse ... it was devastating and tragic and shocking; a very, very sad situation." Daubenberger says the state immediately inspected gusset plates on every single truss bridge in the state to ensure that they were safe, and within months of the collapse, the Minnesota state legislature raised the gas tax and funded a $2.5 billion bridge improvement program. "The bill established a program to have all structurally deficient bridges and fracture critical bridges repaired or replaced within 10 years, so by June 30, 2018," says Daubenberger. The I-35W bridge was rebuilt within 14 months. Daubenberger says 172 Minnesota bridges were identified as structurally deficient or fracture critical. About 35 of them were determined to need only routine, preventative maintenance. About 120 of them have been repaired or replaced, while the 18 remaining bridges are either under construction now and/or are on track to be repaired or replaced before next summer's deadline. "I'm very proud of our accomplishments since 2008," says Daubenberger. "Unfortunately, it was a very tragic situation ... and we never want ever happen again and we're doing a lot of things differently now to ensure that sort of thing doesn't happen." Minnesota has also stepped up and improved bridge inspections, and now even uses drones sometimes to take photos and video of spots on bridges that are difficult for human inspectors to reach. The state now gets outside independent peer reviews of bridge design plans, and it's revamped its bridge maintenance worker training program. "Certainly we've done a lot to ensure the safety of bridges so it doesn't happen again, so I feel confident about the advancements we've made in bridge design, construction, inspection, maintenance and that all works towards good bridge safety," Daubenberger says. But while Minnesota has acted aggressively to reduce it's number of structurally deficient bridges, what about the rest of the country? "America's infrastructure is like a third-world country," says former Republican Rep. Ray LaHood, who served as transportation secretary under President Obama. The American Road and Transportation Builders Association, which tracks the number of bridges with structural defects in each state, found 55,710 bridges nationwide that need to be repaired or replaced. "That's a very costly item," says LaHood, adding that "most states simply do not have the money to take care of them, so they're patching them and they're doing the best they can to keep them in a state of repair where people can drive over them, but it's a serious, serious problem." Federal funding for bridges and other infrastructure needs has remained flat over the past decade, and LaHood is critical of Congress and his own party in particular, for not raising the gasoline tax to increase spending to repair and replace bridges and address other dire infrastructure needs. President Trump has promised to invest a trillion dollars on improving the nation's infrastructure, but other than a broad and vague outline of priorities and talk of leveraging private investment for projects, he has yet to unveil a plan. With federal revenue lagging, many states have followed Minnesota's lead and increased their own gas taxes to fund bridge and road improvements. In the last four years, 26 states have raised gasoline taxes, including red states dominated by fiscal conservatives. That includes Indiana, Tennessee, South Carolina, West Virginia and Montana this year alone. And state funding efforts, combined with a greater emphasis on bridge needs since the collapse, appear to be helping improve bridge conditions. According to the American Society of Civil Engineers, 12 percent of the nation's bridges were rated as structurally deficient in 2007, but only 9 percent are in that category today. Still, ARTBA, the builders' association, estimates it would take more than three decades to repair or replace all those more than 55,000 bridges that need it. It's a challenge that will no doubt grow as structures age and federal interest continues to lag. On this day 10 years ago, the I-35W bridge in Minneapolis was crowded with cars as rush hour was winding down. Just after 6 p.m. local time, the bridge suddenly collapsed and fell into the Mississippi River. Thirteen people were killed. One-hundred-forty-five were injured. The collapse put a spotlight on the nation's crumbling infrastructure, but a decade later, there are still tens of thousands of bridges nationwide that need to be fixed or replaced. NPR's David Schaper reports. DAVID SCHAPER, BYLINE: Nancy Daubenberger is somber at this spot along the Mississippi River in downtown Minneapolis even as cars and trucks rumble and roar above her over the sleek, new interstate highway bridge she had a hand in designing. This is, after all, the spot where much of the twisted steel and crumpled concrete slabs landed when the former bridge collapsed 10 years ago. NANCY DAUBENBERGER: That was devastating and tragic and shocking and a very, very sad situation. SCHAPER: The 35W bridge had been classified as structurally deficient, meaning it was in need of extra maintenance and inspections. In fact, some repair work was going on when it fell. And the 40-year-old bridge was rated as fracture critical, meaning the failure of just one vital component could cause the whole bridge to collapse. And it did. The National Transportation Safety Board determined it was a design flaw that caused the 35W bridge to collapse. Gusset plates that hold the huge steel beams together were only half as thick as needed. The NTSB also found the weight of the nearly 300 tons of construction materials stockpiled on the bridge deck contributed to the collapse. Daubenberger, a bridge engineer who is now director of engineering for MnDOT, says the state immediately inspected gusset plates on similar bridges statewide. And within months, the state raised the gas tax and funded a $2.5 billion 10-year bridge improvement program. The new 35W bridge opened just 14 months after the collapse, and Daubenberger says the state is on track to have all 172 other bridges identified as structurally deficient or fracture critical repaired or replaced by this time next year. DAUBENBERGER: Certainly we've done a lot to ensure the safety of bridges so that it doesn't happen again. SCHAPER: But what about bridges in the rest of the country? RAY LAHOOD: America's infrastructure's like a Third World country. SCHAPER: Ray LaHood was secretary of transportation in the Obama administration. He says more than 55,000 bridges nationwide are structurally deficient. LAHOOD: Most states simply do not have the money to take care of - so they're patching them, and they're doing the best they can to keep them in a state of repair where people can drive over them. But it's a serious, serious problem. SCHAPER: Federal funding for bridge and highway infrastructure has remained flat. While President Trump has pledged to spend up to a trillion dollars repairing and improving the nation's infrastructure, he still hasn't offered a detailed funding plan. So with federal revenue lagging in just the last four years, 26 states have followed Minnesota's lead, raising their own gas taxes to fund bridge improvements. And the number of structurally deficient bridges nationwide has dropped from nearly 74,000 10 years ago to fewer than 56,000 bridges today. But that's still nearly 10 percent of the nation's bridges. Andy Herrmann is a bridge engineer and past president of the American Society of Civil Engineers. He says another crisis is looming as even safe bridges are getting older. ANDY HERRMANN: They were built back in the '50s and the '60s with a 50-year design life. And we have to put the investment in to maintain them, to rehabilitate them, to reconstruct them when needed and to replace them. SCHAPER: The good news, Herrmann says, is that advances in bridge design and construction techniques and in materials make new and rehabilitated bridges safer and longer-lasting. 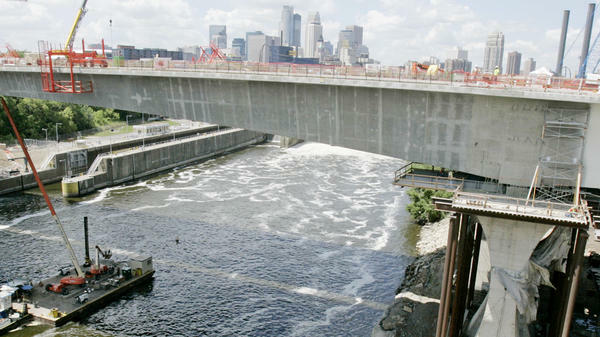 But he says if the Minneapolis bridge collapse was an infrastructure wake-up call, 10 years later, it's still not always being heard. David Schaper, NPR News. Transcript provided by NPR, Copyright NPR.